Following the various landslides that affected Mount San Michele and the township, the Municipality of Foglianise approved a series of measures to protect the area against rockfalls and slope instability including high capacity dynamic rockfall barriers. The installation of five 8m high RMC 850A rockfall barrier sections was recently completed in the town of Foglianise, Benevento, Italy. This barrier, tested and certified in accordance with ETAG 027 (Guideline for European Technical Approval of Falling Rock Protection Kits), currently represents the rockfall barrier with the highest performance in terms of energy absorption capacity. The RMC 850/A barrier, has a Maximum Energy Level absorption capacity of 8600kJ, equivalent to the impact of a 19 ton test block with a velocity exceeding 30 m/s (around 110 km/h). The barrier offers a post-impact residual height that is within Class A of the ETAG Guidelines. Its deflection under impact is also the lowest of equivalent barriers. These stand-out technical characteristics help to deliver reassuring protection performance to clients with unstable rocky slopes. The affected area concerns the Southern side of Mount San Michele, or more precisely, the Barassano district. Indeed, the entire mountain is classified as high risk for falling rocks, as reported in the Hydrogeological Structure Plan (PAI) and evidenced by a history of repeated rockfall events. Numerous damaging hydrogeological events have occurred over the years. The most serious event happened on May 8th, 2000, when 100 m3 of rock fell in the upstream area of the Leschito hamlet. The rockfall barriers provided for this project were installed on the foothills of the southern side of the mountain, close to the populated areas of Barassano and Palazzo. 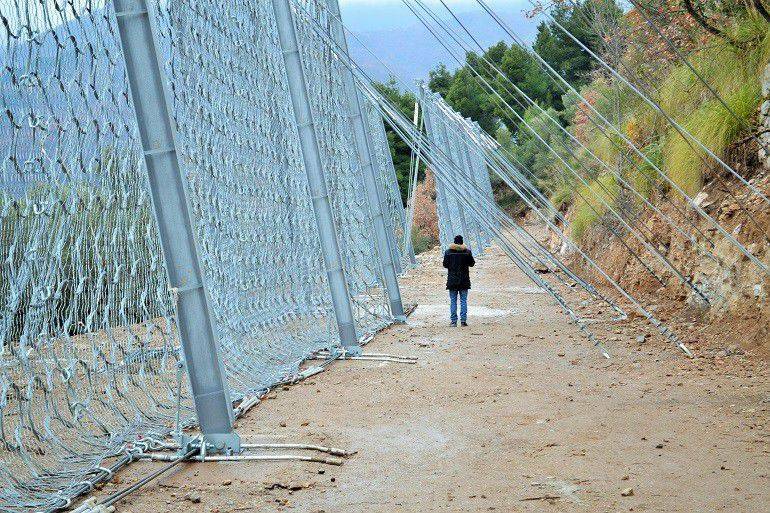 The barriers are 8m high and cover an overall length of about 250 metres, divided into five sections of 50 metres each, for a total surface area of 2,000 sqm.